It is very difficult to get users to switch from one social network to another as users invest significant time setting up their profiles and building out contact networks. 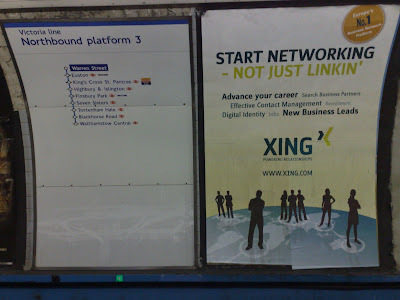 With business platforms it may be easier as the user time per month is significantly less then the time users spend with Facebook etc - however I don't know how many people (other than me) would investigate / join Xing.com after seeing this poster? Strange decision by a web 2.0 network - very offline branding and unmeasurable which goes against the principles of web 2.0 direct marketing. 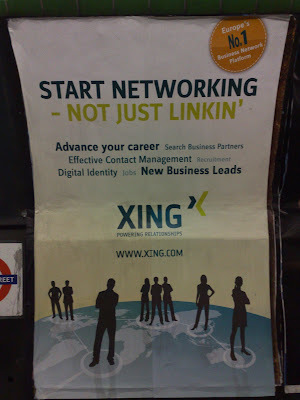 I know Xing have had some difficulty breaking into the UK and have previously tried to target the IT sector, have organised some events and tried renting email lists and viral games to little effect. Linked'in and Facebook are too strong and every other network is here. 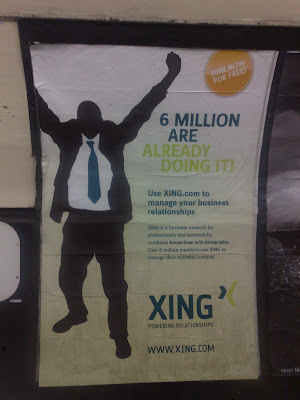 Doesn't Xing play basketball for China?